An administrator or any agent with rights to edit user profiles can take on the credentials of an end-user to view and use Zendesk Support as that end-user. This is referred to as assuming the identity of a user. It can be useful in troubleshooting issues users are having when using your Zendesk Support. Keep in mind that while you're assuming a user, any actions you take, such as creating a ticket or adding a comment to a ticket, are done by the user you're logged in as. Note: To assume an end-user, your Help Center must be activated and visible to end-users. Note: The first time you assume a user you need to click Assume user in the information dialog. You will not see this prompt again. Another browser tab opens where you are logged in as the end-user and can navigate around their view of your Zendesk Support as needed. In the browser tab where you are the end-user, click Revert to your identity at the top. Return to the browser tab where you assumed the end-user, then click Revert identity. Max, you can add "need to disable two-factor authentication on behalf of the agent" to your list. We had an instance where an agent got a new number and lost his recovery codes, so I needed to assume his identity and disable two-factor authentication to get him back in. Luckily the workaround still works, but that'll be tricky once Zendesk Classic goes away. Noted. That said, we will be rolling out the ability for admins to procure a recovery code in such an emergency and provide it to the agent. We'd like something simpler than assumption in this case, and plan to have that live shortly. We're working on it this quarter. It's been almost 3 years since this was requested, but .... is there any ETA on the ability to assume other roles, such as "agent"? Every time I do a training for agents, I have to have THEM log in and show their screens, so I can walk them through. It's very clunky. It would be so much better if I could assume an agent and demonstrate from their perspective or make short training videos. If I demo or screencast from my admin perspective, I see a zillion things that they can't see and the demo is more about what they can't do than what they can/should. It would also be infinitely useful in troubleshooting agent concerns and just figuring out what different agent options do. Every so often, we need to reconsider our agents' capabilities in the system, and I have no way to test on my own to see what effect it has. Has there been any update on allowing administrators to assume the identity of other users than End-Users? I have very similar reasons to Marci's for wanting this. An update or workaround would be nice. Echoing Marci and Paul above. I need to train several new agents as well as validate their permissions before we release their creds to them. Thanks for the feedback, Paul and William. I've asked our Voice of the Customer team and will let you know if there's any word on this. Typo in your opening paragraph: "Zendesk Supprt." Thanks, Mark. We'll get that corrected. Welcome to the Zendesk Community! +1 to the ability to assume agents and admins role for other admins or owners. Has there been an update to how one assumes the identity of an end user. I am attempting to assume the identity of a sample customer so that I can preview a form I've created. However, the drop down described here does not include an Assume Identity option. How do you preview my form as an end-user? @Zendesk, is there any update to adding the ability to assume agent roles? Marci's comment in 2016 describes precisely my use case as well. I know there are lots of issues to consider when adding features, but I'd be willing to discuss further ideas or workarounds if needed. This is not something currently planned for development, however, you are welcome to post your suggestion and detailed use-case in the Product Feedback topic, which our Product Managers follow. Here's how to create a feedback post. So we can't assume the identities of end-users anymore? I need to preview my form, to understand what end-users are seeing. My apologies, I was referring to the ability to assume an agent. Assuming an end-user is still available. To preview a form as an end-user, the easiest way to do it would be to visit your Help Center via an incognito window or after logging out as an agent. Alternatively, you should be able to do this through the "customize design" section of your Help Center theme. How can I visit the help center if it requires a login but I only have agent access? When I log in it just takes me right to the agent window. Have you followed the instructions to assume an end-user's identity outlined in this article? Yes, as you will see in a previous comment of mine, I included a picture of the drop down associated with the sample customer. There is no option for "Assume Identity." Here it is again, in case you can't see the previous comment. Sedd, what's your role in your Zendesk instance? The only reason I can think of that you can't see that option is that you're not an administrator in your Zendesk. I am an administrator. I have the capacity to create forms, which is what I'm doing, so that means I am an admin, right? But I can't view them as a user. I tried making an end-user account and that didn't work either. I specifically requested admin access this morning, was granted it, and started making forms. So....? It looks like the end-user assumption will only be available if Guide is currently active for end-users. I'm reaching out to our Documentation team to update this article to reflect that. Thanks for bringing this to our attention. Hello Gaetan, the agent needs to have access to all tickets. Can you confirm the plan level you're on? 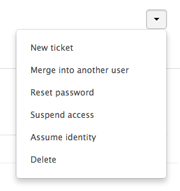 If you're on enterprise, you'd see this option under Admin>Manage>People>Roles. Otherwise as Andrew mentioned, if you give agent access to all tickets do they then see the option in their profile? All good. Thank you. if possible, please mention this more clearly in the article.